Friday August 3rd 1883 Otto went on home this morning. I was down to the house for dinner and in the afternoon was at Forneys awhile. Went to Tallents where I stayed till after supper Charles came for me and we made a call at Brydolfs. We took the nine oclock car for down town and by the time we had climed north hill were tired enough to go to bed. 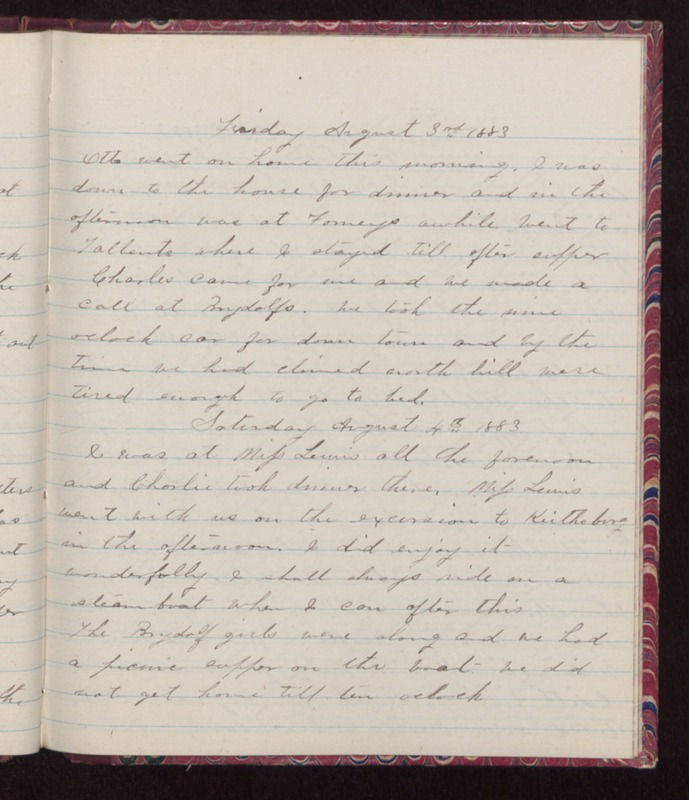 Saturday August 4th 1883 I was at Mifs Lewis all the forenoon and Charlie took dinner there. Mifs Lewis went with us on the excursion to Keithsburg in the afternoon. I did enjoy it wonderfully. I shall always ride on a steamboat when I can after this The Brydolf girls were along and we had a picnic supper on the boat we did not get home till ten oclock.